This cheesy chicken salad panini with a Southwestern kick will make you walk away from plain, boring sandwiches forever. 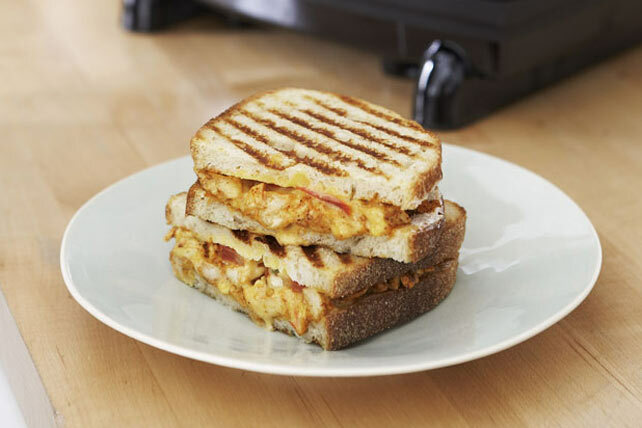 Fill bread slices with chicken mixture, tomatoes and 2% Milk Singles to make 4 sandwiches. Grill 3 to 5 min. or until Singles are melted and sandwiches are golden brown. Heat grill pan or large skillet on medium heat. Cook sandwiches 3 to 5 min. on each side or until golden brown on both sides, gently pressing down tops of sandwiches with spatula to flatten slightly as they cook. Chicken salad can be prepared in advance. Store in airtight container in refrigerator up to 2 days. Use to assemble sandwiches just before cooking as directed. Have some leftover turkey? Use it instead of the chicken in these tasty sandwiches.